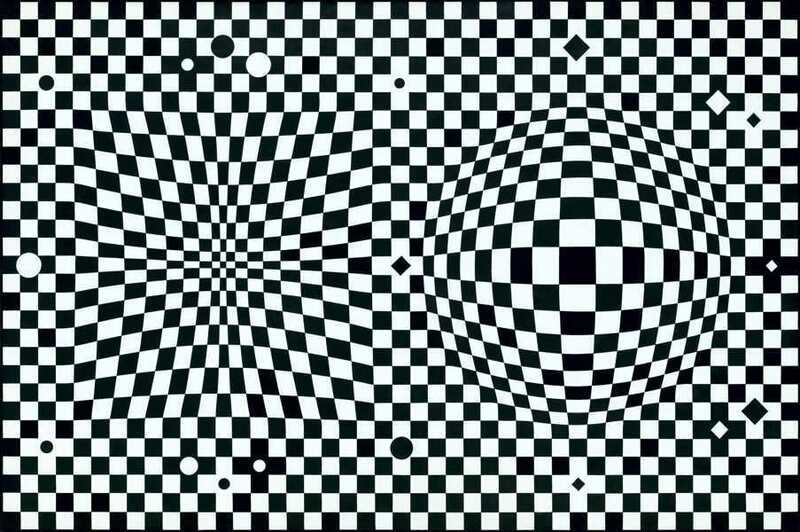 The Op Art, short for Optical Art, developed during the ’60s, and it’s still lasting today. It’s important to know how it started and who are the key concepts, to understand why it’s so catchy nowadays. The Op Art is included in the major movement of the Kinetic Art, that Duchamp helped developing. 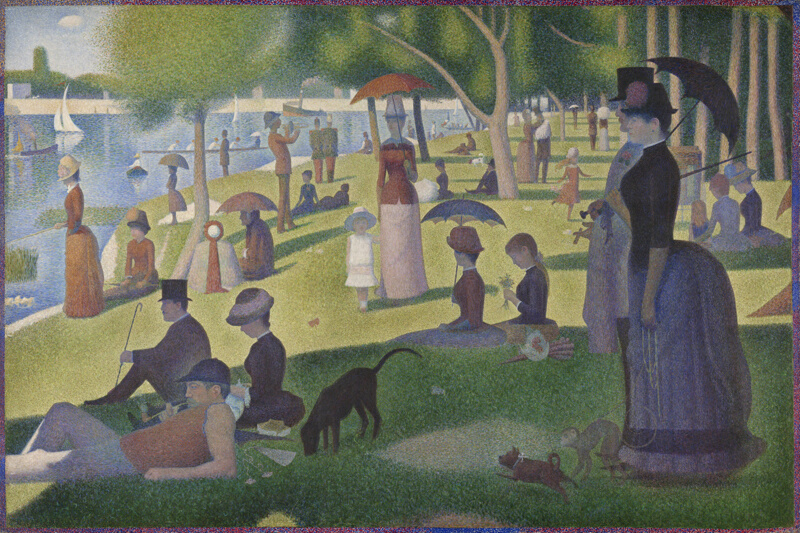 Georges Seurat, A Sunday on La Grande Jatte, 1884 – the artist was using mainly primary colors, in such a way that the eye could see any other color. If we want to search back for what influenced the Op Art we have to look at the post-impressionists first: the artists who worked on the Pointillisme – like Georges Seurat – already wanted to create an illusion on the viewer, making them see colors that weren’t there. Even more back in the history of art, the technique of the trompe-l’œil (coming from the French for “fool the eye”, it was a technique used mainly in frescos to give the illusion of an architectural structure) was already an attempt to create something that wasn’t there. This will of the artists of playing with the illusions has always been present, and with the Optical Art this is brought to the extreme limit. The Op art started in the ’60s and we can say that it never lost its fascination, but at the beginning it wasn’t very considered to be art at all. The first time that the critics started changing their ideas about this movement was when the exhibition called The responsive eye was organized, involving the major artists of this genre. 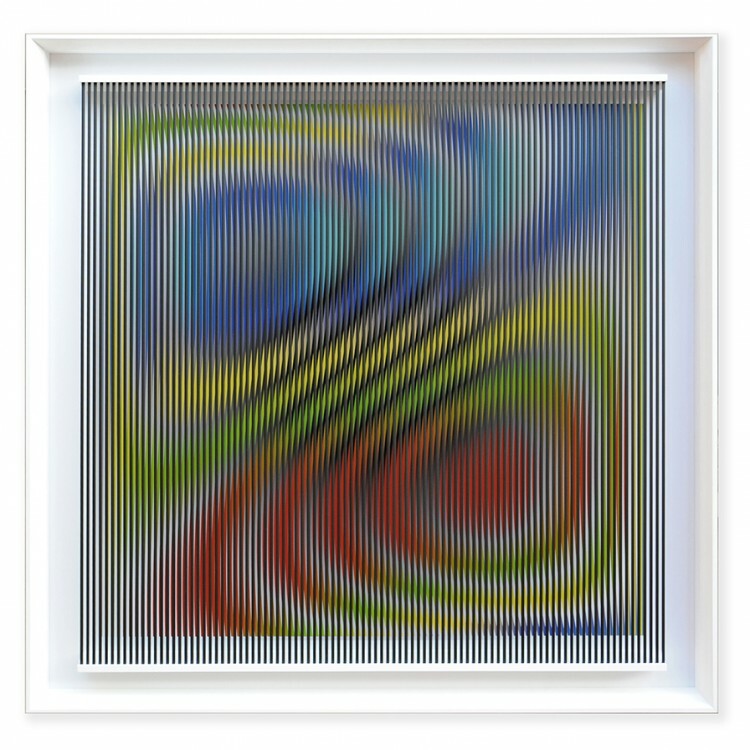 The movement is a fundamental feature of the Op Art, because many times the works want to give an illusion of some sort of movement even though there is none. It comes directly from the first experiments with graphics and movement of Marcel Duchamp, who was particularly interested in it. Here you have an example of his work. The Op art is basically graphic, no videos, no photos, no other media are involved in the process most of the times. The aim of the artist is to create a perceptive instability in the viewer, to induce their involvement in the fruition of the art. In effect, it can be difficult to stare at these works for too long. Most of the works belonging to this movement are in black and white, but many others play with colors in a very original way. 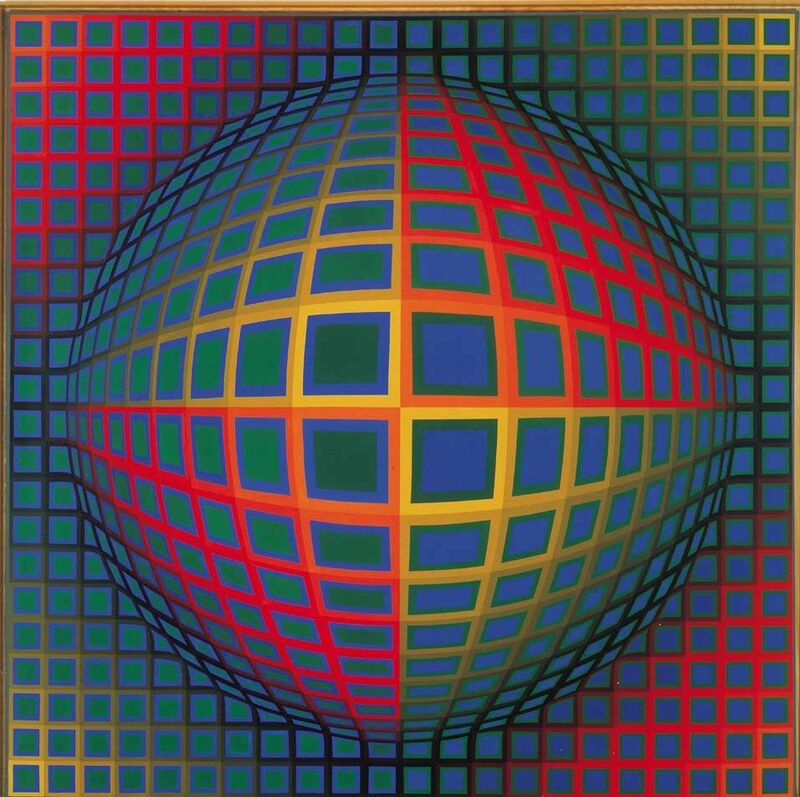 Victor Vasarely was one of the first artists to discover how to create the illusion of movement just with graphic designs. He was probably the most important artist of the Op Art ever. His main idea was to make the public an active agent with his art, because the viewer “changes” the painting when moving around it. Bridget Riley works with completely abstract figures, studying their interactions very carefully with preparatory drawings and sketches. The final product is then painted by her collaborators in a very precise way. She worked with both colors and b/w paintings, but maintaining the abstraction. He was a Venezuelan artist, and he had the impresion that art in his country was going to a wrong direction: he wanted art to go back to its purest form, so he painted abstract figures, creating optical illusions and demonstrating his amazing technique. He was also into sculpture and installation, making the same outputs. Alberto Biasi was an Italian artist, he was among the founders of the Gruppo N in Padua, Italy. He worked a lot with the experience of the viewer in his art, creating entire environments with this aim in mind. His optical works go in the same direction, playing with the perception of the public and almost hypnotizing them. Escher is probably the most famous artist among the ones that I already presented, but it would be reductive to just define him as an Optical artist. Instead, I would really suggest you to go explore is work much more, and discover how incredible it was. The Op Art is lasting until today, and this already is evidence of how much it is loved by the people. Nowadays we can see its legacy in every little trick that is made to fool our senses, that we literally find in any part of the web or of cultural institutions.